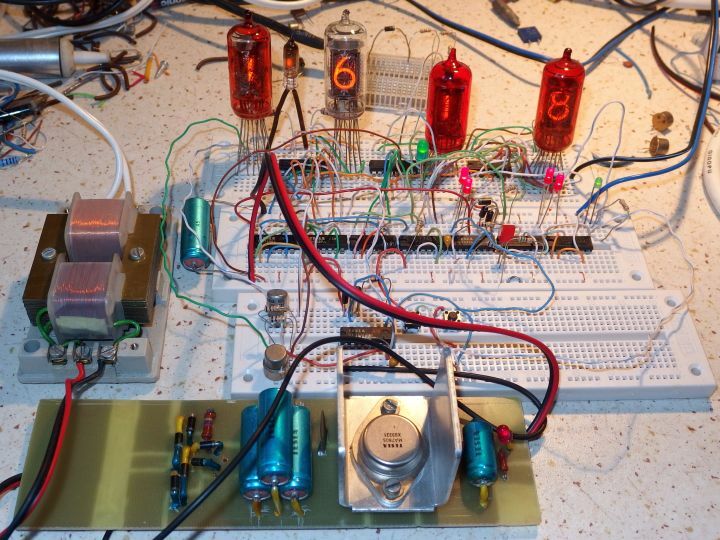 I've already successfully built a Nixie clock without microcontroller. 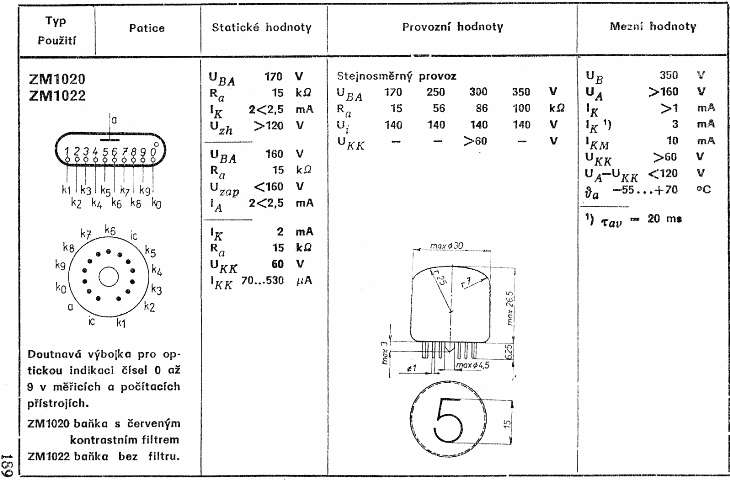 Now I have decided to go even further and construct a Nixie Clock with TTL logic from Czechoslovak Tesla. Just like it would have been built in the 1970's, the peak of nixie era. It is actually not a replica of any mass-produced device (nixie clocks have never been produced as a household appliance). It is rather an imitation of homemade digital clock from 1970's period. 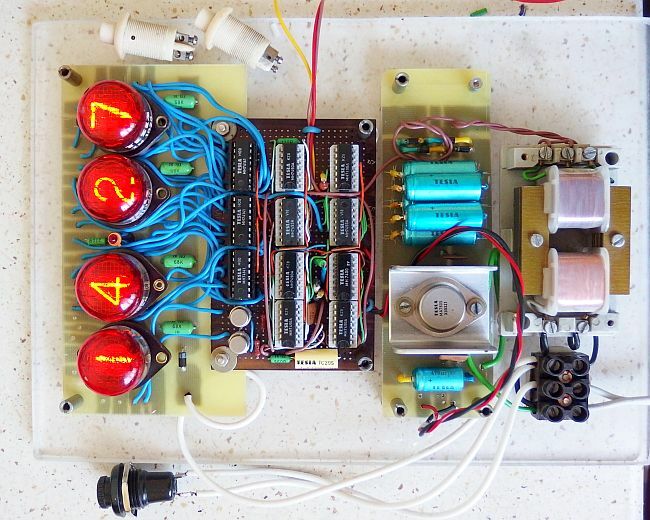 Let's take a travel back in time into the good old days and build a digital clock like the enthusiasts have been doing it in the 1970's - the TTL and nixie times. 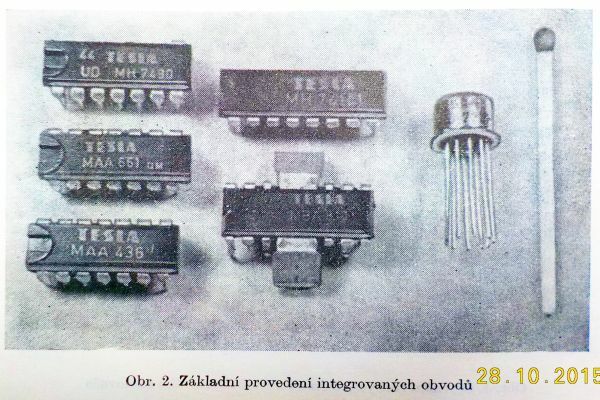 At the beginning of the 1970's, Czechoslovak amateurs got hold of the miracle of this era - TTL logic ICs. An interesting application of these circuits is a digital clock. Around 1970, Tesla National Corporation started to produce a decimal counter MH7490 (later MH7490A) and hexadecimal counter MH7493 (later MH7493A) which are perfect for the construction of a digital clock. Those are clones of the Texas Instruments SN7490N, SN7490AN, SN7493N, SN7493AN. At that time the first amateur constructions of clocks appeared. As a display, nixie tubes were commonly used. 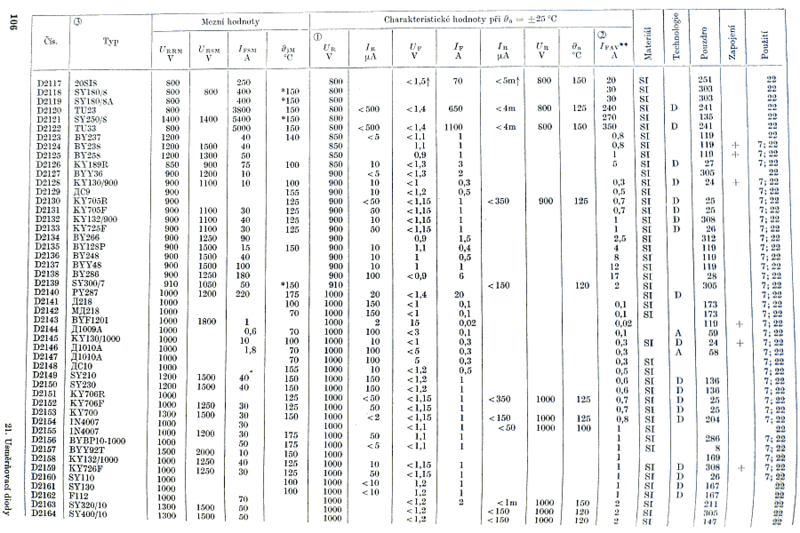 In literature from 1969, the Tesla ZM1020 nixie is first mentioned. Then Tesla started to produce ZM1080T (in 1971) and ZM1040 (in 1973). 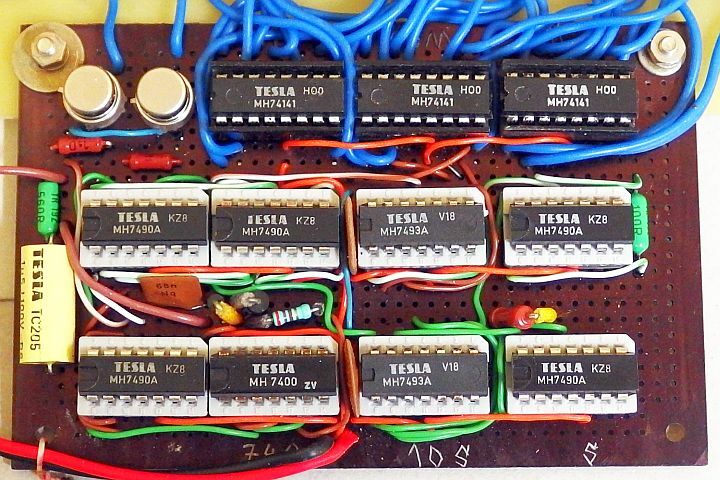 In early 1970s Tesla also began producing the famous circuit MH 74141, the BCD to 1 in 10 decoder with outputs designed to directly drive a nixie. Digital clock is essentially composed of several chained counting circuits, where the overflowing counter increments the next one. The counters are in this sequence: Ones of seconds, tens of seconds, ones of minutes, tens of minutes, ones of hours and tens of hours. Ones of seconds and ones of minutes count 0-9 (a total of 10 states), and therefore decade counter MH7490(A) is most suitable. Tens of seconds and tens of minutes, counting from 0-5 (6 states) require base-6 counter. That does not exist, but it is possible to create it by limiting the counting cycle of a higher-base counter. This may be, for example, octal, decade or hexadecimal counter. Limitation of counting cycle is done using the reset inputs. These inputs are connected to the outputs so that when they reach a certain state, the counter is reset. If the counter has to count from 0 to 5, then the state 6 must trigger a reset. Two reset inputs R0& (Which act as AND gate) are connected to the outputs B and C (second and third lowest bit). When it reaches 6 (binary 110) both of these outputs are in log. 1 and the counter almost immediately resets to 0. A little more complicated is the counting mechanism of hours and tens of hours. In state of 9, further incrementation must set ones of hours to 0 and increment tens of hours. But also at 23, the next incrementation must lead to 00. The best solution is to use decade counter MH7490(A) for ones of hours, which alone skips to 0 after 9. To count tens of hours, any counter capable of states 0 to 2 can be used. The entire pair of counters has to be reset when reaching 24 (in the BCD code 10 100). 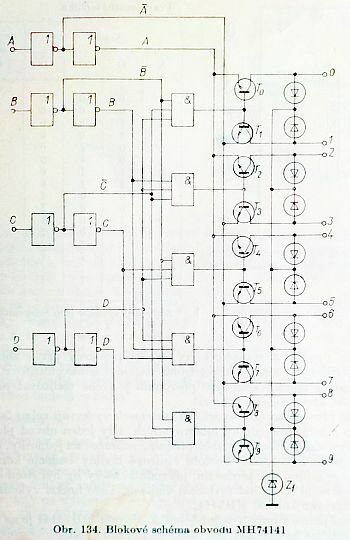 The reset inputs of the two counters thus connect at the second bit tens of hours (output B) and the third bit of ones of hours (output C). Now we have a system to count time. We also need a source of pulses with a frequency as accurately as possible 1Hz, namely with a period of 1s. Since the accuracy of RC or LC oscillators is not enough for a clock, there are basically two viable solutions: Using a crystal or mains frequency. Crystals were still expensive and hard to find in the 1970's :). Moreover, the crystal frequency is relatively high (at least tens of kHz). To obtain a frequency of 1 Hz you need a large number of counters connected as frequency divider. For 100kHz crystal, for example, you need 5 decimal counters MH7490 / MH7490A. Counters were, of course, also very expensive and rare :), and therefore a 50Hz power grid frequency was usually used as a standard. To obtain 1Hz you only need two counters and no crystal or crystal oscillator circuit. The /50 division will require only one decimal counter and one base-5 counter. Mains frequency from a transformer secondary is shaped using a circuit that converts a sine wave to a rectangular waveform compatible with TTL levels. The usual "textbook" clock contains 8 decimal counters Tesla MH7490 (or MH7490A). First, the 50Hz mains frequency is shaped and divided by 5 and by 10 (in any order), then divided by 10, 6, 10, 6 and finally by 24 using a pair of counters. But this "textbook" circuit can be optimized to omit one IC package. We'll use some of hexadecimal counters MH7493 (or MH7493A). Decimal counter MH7490(A) is actually composed of two independently usable counters - binary and base-5. 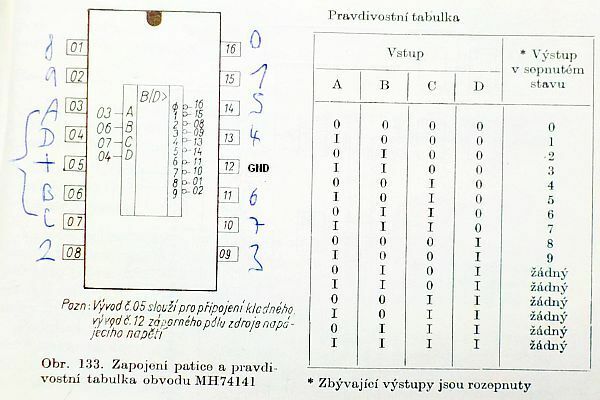 Hexadecimal counter MH7493(A) is similarly composed of two counters - binary and octal. This is useful for circuit optimalization. For ones of seconds, ones of minutes and ones of hours we use full decimal counters. For tens of seconds and tens of minutes we use octal counters in MH7493, limited to base-6. Binary ones will remain for other use. For counting tens of hours, two binary counters of two MH7490's are used, thereby forming a base-4 counter. For the purposes of counting tens of hours it is sufficient. The two unused base-5 counters will be used to divide the grid frequency from 50Hz down to 2 Hz (50/5/5 = 2). 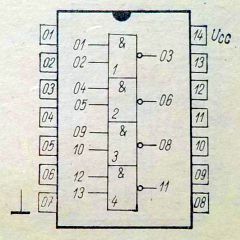 One of the unused binary counters in circuits MH7493 is used to divide the resulting 2Hz frequency to 1Hz, which can already enter the seconds stage. The 2nd binary counter (in the other MH7493) remains unused. It can possibly be used as an additional divider if we wanted to clock the clock using 100Hz from a bridge rectifier. Binary and base-5 (or base-8) counters in one package share reset inputs, but it does not matter as long as the reset function is used in the higher-order counter. During reset, counter of lower order would have advanced to 0 anyway. (Higher counter advances only in a situation when all lower counters overflowed to 0.) The circuitry for counting hours and tens of hours consists of three MH7490. Reset inputs of all three are thus connected together. After optimization, the number of counting circuits is reduced from eight to seven (five MH7490 and two MH7493). Reset inputs in ones of seconds and ones of minutes are not used, so they have be connected to GND. MH7490 circuits additionally contain inputs R9&, presetting values ​​9, which are also not used, and therefore connected to GND too. In the circuits MH7493 only inputs R0& are present. When counters are chained, the input of a higher counter is always connected to the highest used output of a lower coutner. Any usefull clock also has to have a method to set it. 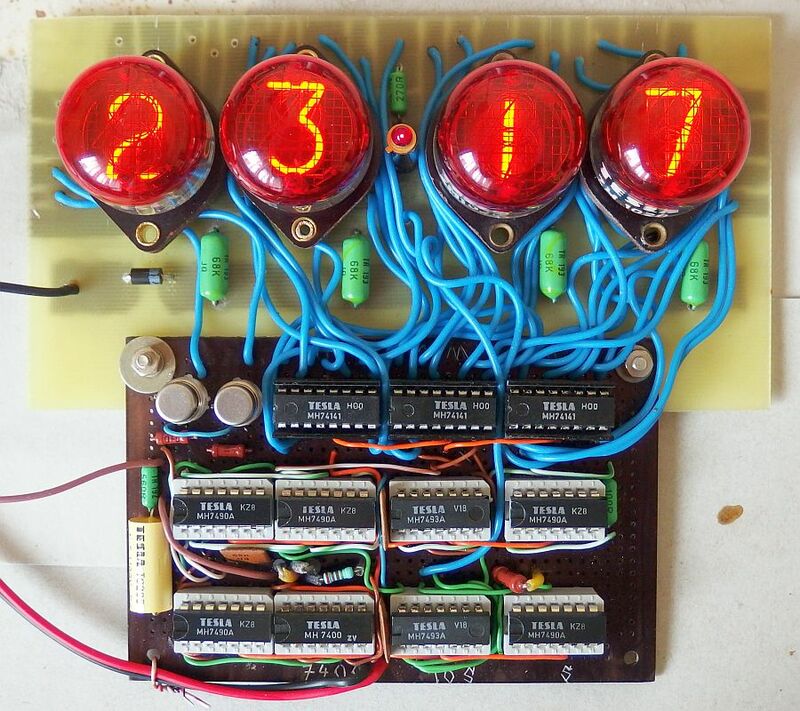 This nixie clock is set using two buttons. One button to set hours and then one to set minutes. During setting of hours, the 50Hz signal passes through base-5 part of the minute counter and then through tens of minutes. The 50Hz frequency is divided by 30 and generates 1.666 Hz, enabling you to set the hours comfortably. Similarly, when you set minutes, the 50Hz frequency passes through the base-5 part of the ones of seconds stage and then through tens of seconds stage. Therefore, the frequency while setting minutes is also 1.666 Hz. Some of the more elaborate clock designs use Exclusive OR (XOR) MH7486 with debounced buttons. Such circuit, however, is somewhat more complicated and requires more integrated circuits. For simplicity, therefore, most clocks were built as shown in the diagram below. Normal operation frequency enters the counter via a resistor and fast frequency via a button with series 1nF capacitor. The signal passing though the contacts of the button is divided by 30 before reaching the counter being set. This in practice is usually sufficient to eliminate bouncing buttons. Button bouncing is further reduced using the 1nF capacitor is series - the setting impulse is short and unlikely to be shattered into more impulses. 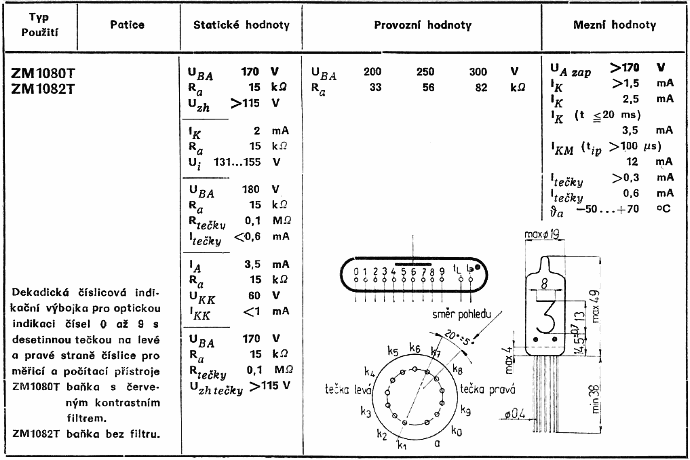 Mains frequency has to be properly shaped. It is necessary to create a TTL compatible square wave from the sine wave. Since the power grid is full of random pulses, harmonic frequencies and interferences, it is necessary to use a low pass filter (RC network) and also a Schmitt circuit with hysteresis. Without this, it is virtually impossible to sync the clock using mains frequency. A low pass filter or a Schmitt trigger alone are not sufficient, we need a combination of both. Some designers have come to a wrong conclusion that the mains frequency is unusable, as they have used improper shaping circuit. If the interference pulses are not filtered, they will be counted in counters and the clock may run faster. Shaping circuit is created using a Tesla MH7400, which contains four 2-input NAND gates. In a digital clock, the time is obviously not only counted, but also displayed. In the 1970s and early 80s, nixies were the most common and affordable numeric display. 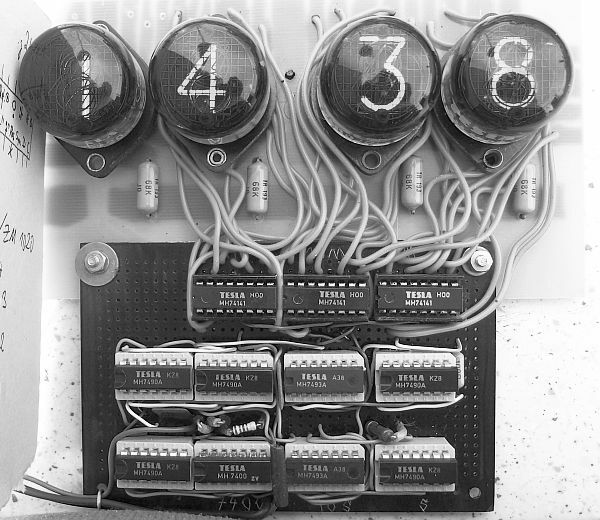 Seven-segment LED displays were still relatively unavailable and expensive. Their luminous intensity was very low and the character displayed small. Additionally, BCD to 7 segments decoreds were hard to find in Czechoslovakia. In contrast, nixies were already established and proven type of display. The MH74141 drivers designed for nixies were already part of Tesla production. For this reason, the nixies were virtually the only choice. 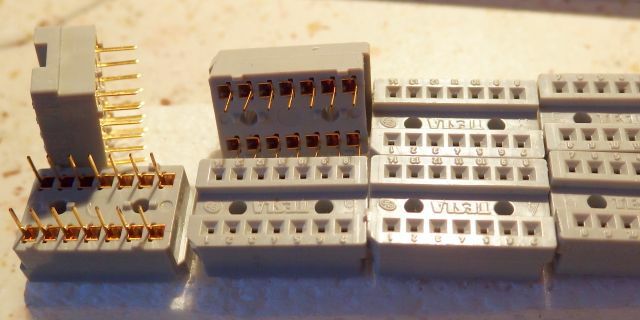 Tesla produced basically only three types of suitable nixies (unless you count the colorless versions as another type): ZM1020, ZM1040 and ZM1080T. Big nixies ZM1040 (31mm digit, side view) mostly didn't get into the hands of amateurs before 1990s, when they got into sales for a few cents, or even into dumpsters, due to their obsolescence. Small nixies ZM1080T (13mm digit, side view) were a bit more accessible. They don't use a socket, they are soldered direclty into the PCB. If you need the possibility to replace the nixie (or to use it elsewhere later) only one option remains - ZM1020. It's a top view nixie with 15.5mm digit, installed into B13B socket. I also chose this type. The ZM1020 is the very first type of nixie tube produced by Tesla, and thus it is best for a retro clock :). Seconds don't have to be displayed. The oldest clocks usually displayed only hours and minutes for economical reasons. This saves two nixies and two MH74141 drivers. During the 1970s the MH74141 was still relatively expensive and so constructers tried to reduce their coutn to a minimum. 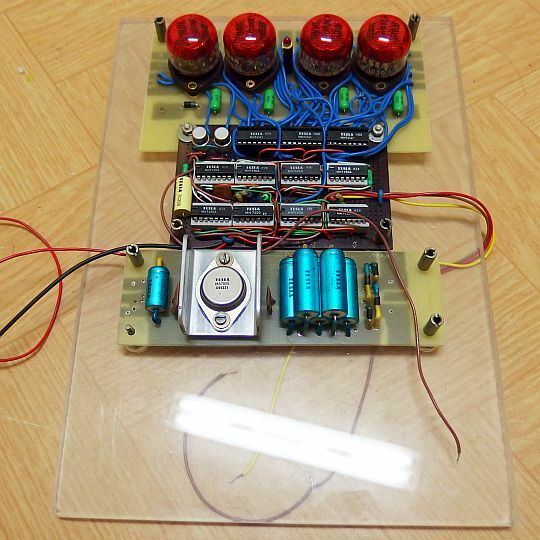 To control the nixie at tens hours thus, instead of this driver, they cleverly used just two transistors. Only digits 1 and 2 ever appear in this place. The leading zero is not displayed, which in not for bad. BCD decoding is not necessary, because only states 0, 1 and 2 are possible. The lowest bit (A) of BCD always denotes number 1 and the second lowest bit (B) number 2. Replacing the MH74141 by 2 transistors and zero blanking also leads to less power consumption. If seconds are not displayed, only 3 MH74141 drivers are needed. The transistors are high voltage low power types. In the old days, the most appropriate were transistors designed for video amplifiers, for example. BF259, SF359, BF459, KF422, KF469. Voltage drop of the nixie tube is subtracted from the anode supply, so the voltage rating demand on the transistor is slightly reduced. If no high-voltage transistors were available, engineers solved a problem using a small thyristor (SCR), for example. KT506 or KT508/400. Thyristors may be used only when the nixie anode supply is pulsating (half-wave or full-wave rectified AC voltage without smooth capacitor), not when smooth DC voltage is used. For completeness we can add a (blinking) dot to separate hours and minutes. This can be miniature tungsten bulb, neon glow lamp, or a very modern :) first Czechoslovak light-emitting diode (LED) Tesla LQ100 in a beautiful gold-plated metal case. 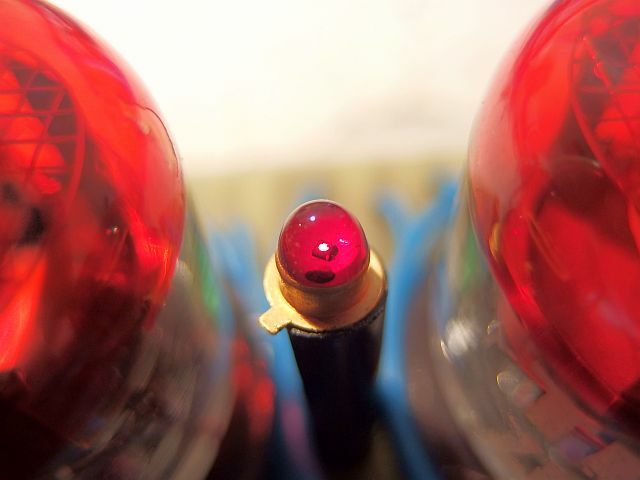 The red light-emitting diode has a luminous intensity (only) 0.8mcd at 20mA and red lens, that tends to fall off just from a wry glance (of course, with chip), but it's simply our first LED ever :). Max. current is 50 mA and max. peak current according to the datasheet is incredible 5A. The forward voltage drop is only 1.65V and hence it can be powered directly from the logic. The digital clock naturally needs a power supply. First, the supply of regulated 5V DC and also anode voltage supply for nixies which must be at least 170V (however, for better stability of nixie current, it is better to use even higher voltage). The 5V is obtained using mains transformer, bridge rectifier and a regulator. The oldest regulators used a Zener diode and a power transistor. A bit more modern design uses monolithic regulator of fixed 5V voltage - Tesla MA7805 in TO-3 metal housing. It is mounted on a small heatsink. At the input and output of the regulator close to the pins are ceramic bypass capacitors with a value of about 100nF. On the input side I used Tesla TK783 rated at 32V. On the output side Tesla TK782 (rated 12.5V) is enough. Same capacitors will also be used to block the supply voltage on the logic board. 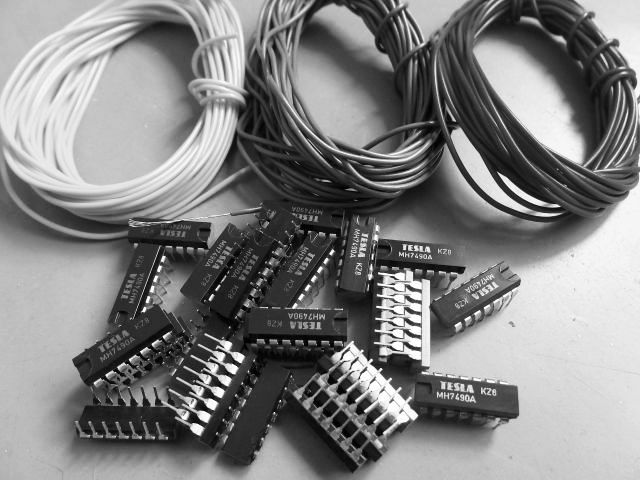 Consumption of logic circuits MH7490A is 29 mA (<42mA), MH7493A ... 26 mA (<39mA), MH74141 ... 27 mA (<32mA) and MH7400 ... 12 mA (<22mA). Total consumption of the clock logic without seconds display (3x MH74141 used) is thus 290mA typical, 406mA maximum. We also have to add the consumption of other components, as MA7805 own consumption, LED, base resistors and sync resistor, together about 25 mA. Maximal total current drawn from the secondary of the transformer is therefore cca 431 mA. The MA7805 regulator requires an input voltage of at least 7V. Adding voltage drop across the filter capacitors around 1.2V (for the capacity of 3000uF and current 431 mA) and the drop of rectifier diodes max. 2x 1.1V the minimum amplitude of the secondary AC voltage has to be 10.4V. This corresponds to the rms value of about 7.3V~. If we consider the -10% error of mains, the minimal secondary voltage is 8V~. We'll use a transformer 8 to 10V, cca 500mA. As an anode supply for nixies, you can use DC voltage (with a smoothing capacitor) or a pulsating voltage from a half-wave of full-wave rectifier without smoothing capacitor. The voltage can be obtained either from a transformer, or directly from the mains. I use single halfwave operation directly from mains (220 - 240V), anode resistors are 68k / 1W. 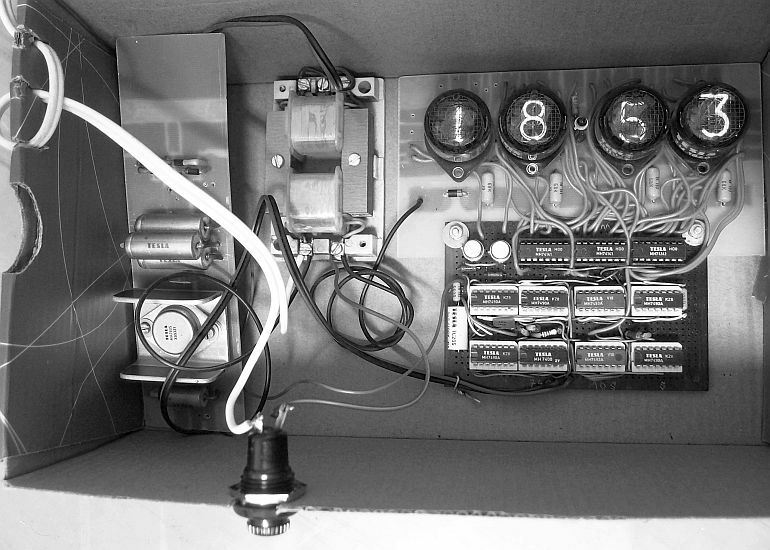 When nixies are powered directly from the mains without isolating transformer, the entire circuit of the clock (including the 5V logic) is galvanically connected to the mains and must therefore be suitably protected against contact with live parts. Also, the buttons must be suitable for operation with mains voltage. 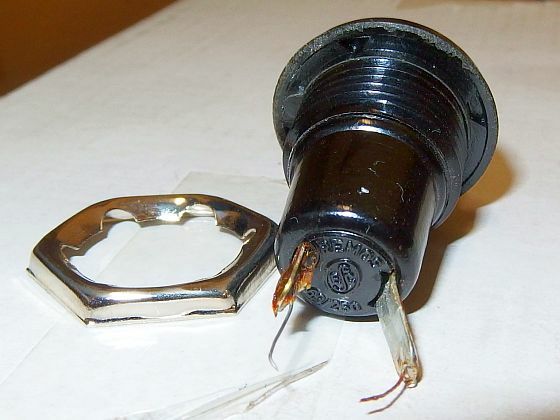 In all cases, use an appropriate fuse in the mains input, especially to reduce the risk of fire. 13. 2. 2019 - almost 3 years of operation with no failure or signs of wear. 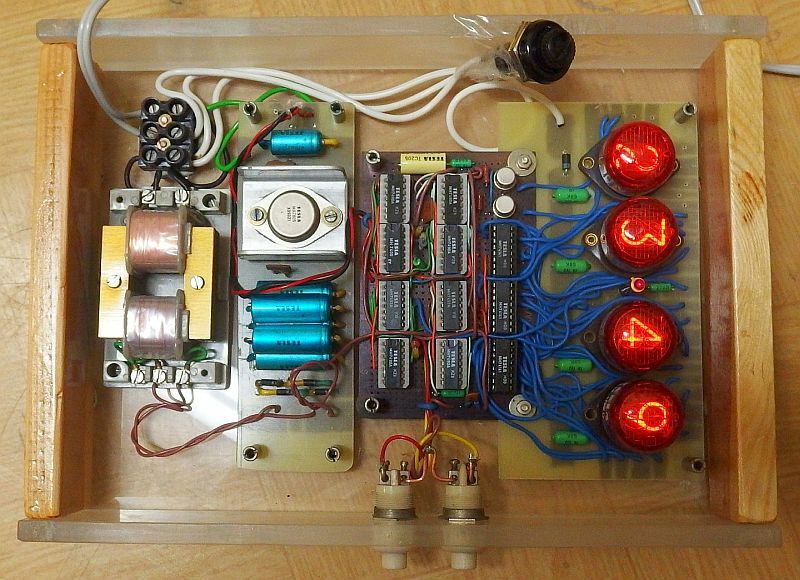 Warning: The nixie clock operates with a deadly voltage. All its components must be suitably insulated and not accessible from the outside. The buttons must be designed for mains voltage, because their contacts are not isolated from mains. The device must be fitted with suitable fuse to reduce the risk of fire. The construction is only suitable for skilled persons who are competent of safe work with dangerous voltage. You do everything only at your own risk. The author takes no responsibility for any of your damage, injuries or death. TTL nixie clock schematic - Power supply and 50Hz shaping circuit. 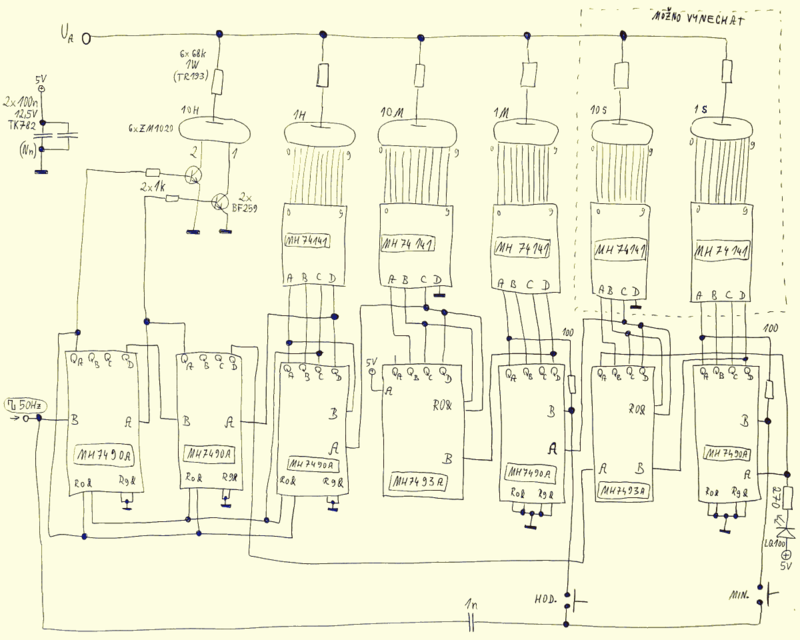 TTL nixie clock schematic - TTL logic (counters, drivers), nixies. (The seconds can be omitted). 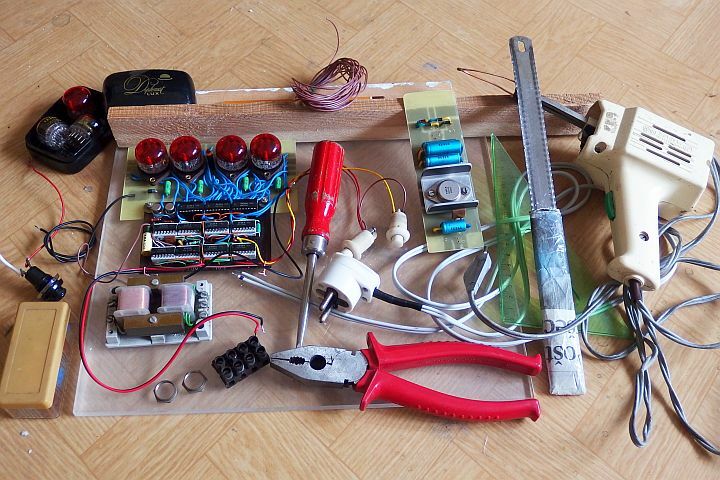 TTL Nixie Clock prototype in a breadboard. TESLA MH7490A TTL logic and vintage Kablo Kladno wires :). 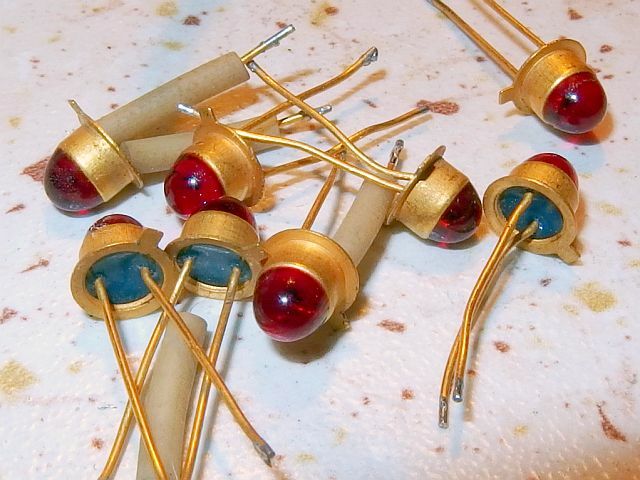 Tesla DIP14 gold plated sockets. Tesla DIP16 gold plated sockets. Tesla has been producing only 3 types of standard numeric nixies: ZM1020, ZM1040 and ZM1080T (if the versions ZM1042 and ZM1082T without red filter don't count as other types), so the choice is not so hard :). 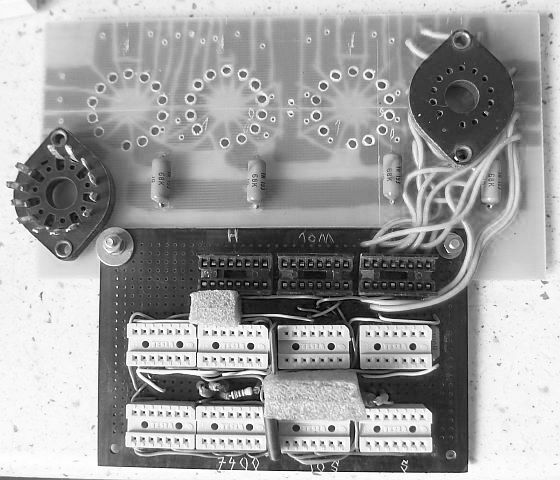 TTL logic board of the nixie clock (7400, 7490, 7493, 74141). 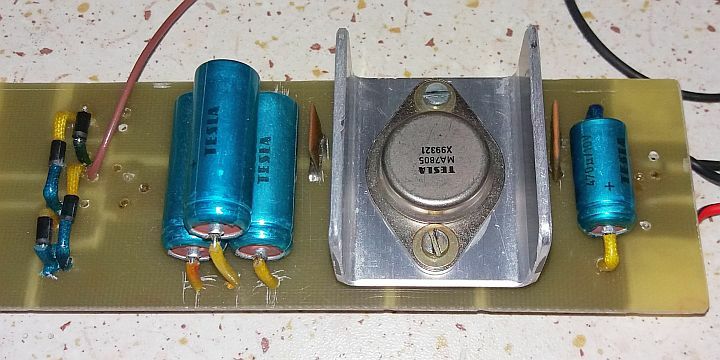 Silicon world miracle - first Czechoslovak LED diode Tesla LQ100. 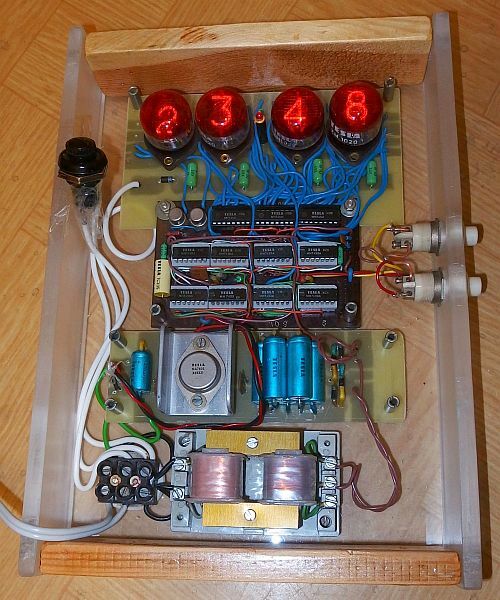 TTL Nixie Clock - nixie board and 1970's TTL logic board. Tesla LQ 100 LED diode operating. It is hard to photograph and it produces such a deep red light, the photo just can't reproduce it. Regulated 5V supply with Tesla MA7805. Vintage Remos brand panel mount fuse holder. Test of the clock before putting it into a box. 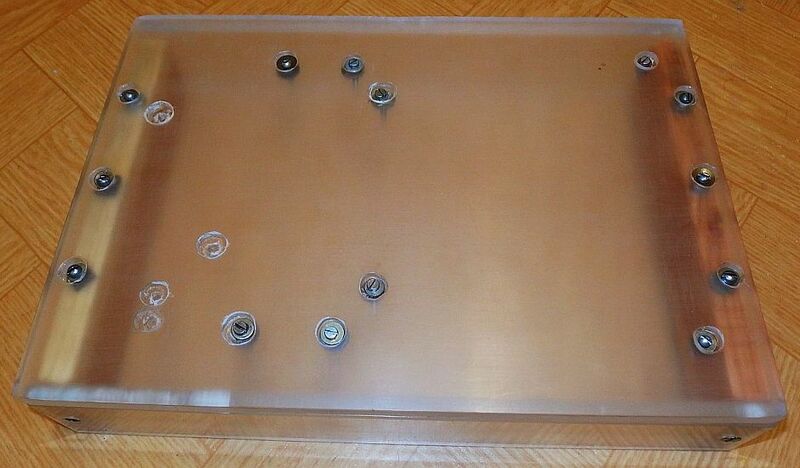 Making a box for the nixie clock. Testing the nixie clock. Only the back of the cabinet is finished. 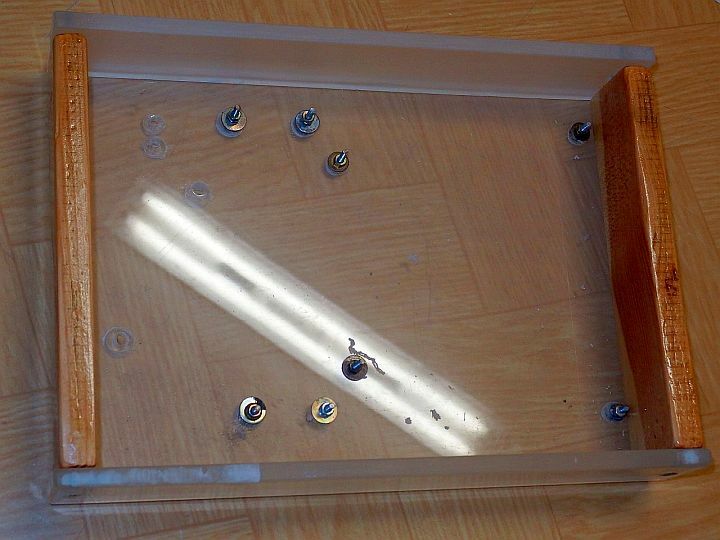 Making the frame of the nixie clock out of plexiglass and wood. Nixie clock cabinet from back. TTL Nixie clock in the cabinet. Almost finished nixie clock. 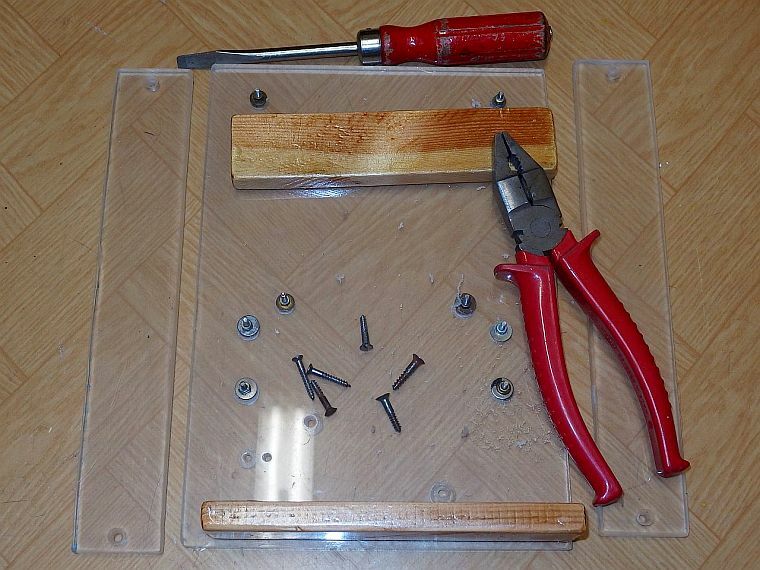 I only have to drill a hole for the fuse holder and put a front plexiglass on it. Datasheet of Tesla ZM1020 nixie. Datasheet of Tesla ZM1080T / ZM1082T nixie. 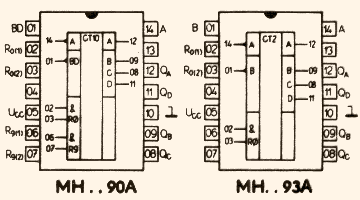 Pinout and truth table of MH 74141 (seems to be equivalent to Texas Instruments SN74141 / SN74141N). Vintage photo of Tesla MH74141 and MH7490 in a book from 1977. Dataasheet of Tesla MH7490A and MH7493A. Tesla MH7490A a MH7493A pinout. 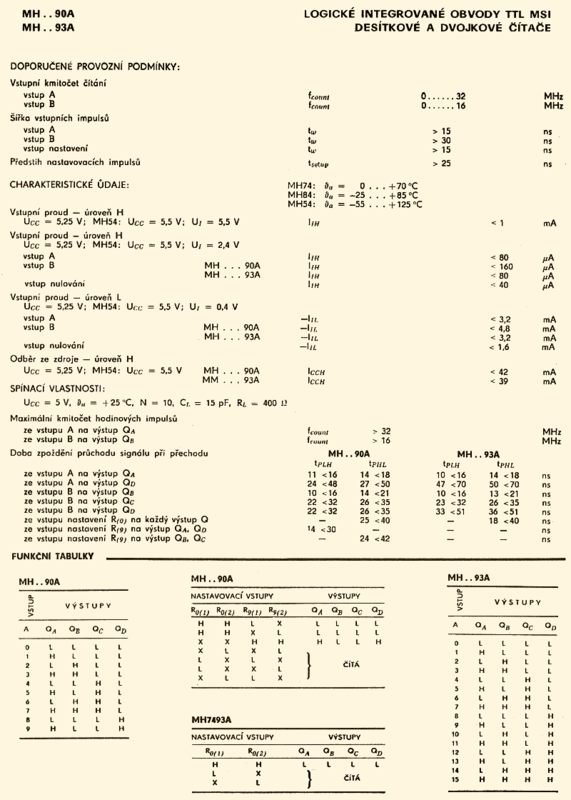 Binary and BCD counters in 1980 catalogue. Rectifying diodes including KY132/1000 (in 1980 catalogue). 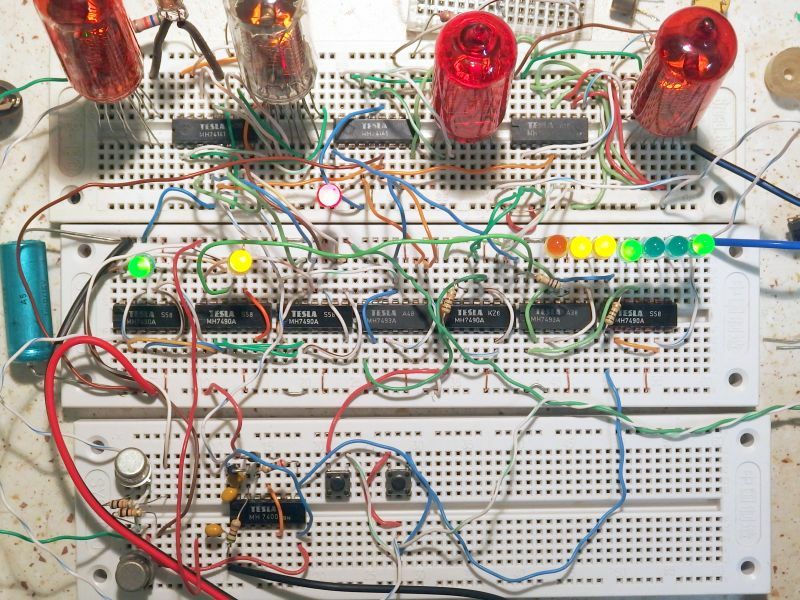 Video - testing the 1970's nixie clock design in breadboard.